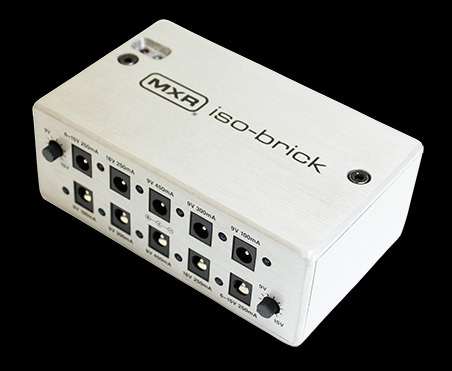 The MXR ISO-Brick Power Supply is small and light with tons of quiet, noise-free DC power on tap ready to run a wide range of pedal types without crowding or weighing down your pedalboard. For a quick YouTube Video click here. Each of the ISO-Brick Power Supply's 10 outputs is fully isolated, eliminating gig-ending ground loop noise. Whether analog or digital, positive or negative ground, this power box has you covered. The MXR team broke down these 10 outputs to accommodate a variety of voltage and current requirements: two 9V outputs at 100mA, two 9V outputs at 300mA, two 9V outputs at 450mA, two 18V outputs at 250mA, and two variable outputs adjustable from 6V to 15V at 250mA. The two variable outputs can be used to emulate voltage sag, a drained battery effect sought by many vintage tonechasers. Powers a wide range of pedal types, digital and analog, positive and negative ground. (2) 9V outputs @ 100mA, (2) 9V @ 300mA, (2) 9V @ 450mA, (2) 18V @ 250mA, and (2) variable outputs adjustable from 6V to 15V @ 250mA. Variable outputs can be used to emulate drained battery effect. Includes all cables as supplied by MXR. 10 Pedal power cables and main unit power supply.